After two days of the most frenetic activity imaginable, no sleep and obscene amounts of coffee and Red Bull, ten teams sat expectantly, staring through bleary eyes as the judges prepared to deliver their verdict. I looked at Stuart. Stuart looked at me. We knew that we had done everything that we could and were absolutely wrapped with the result that our combined team had put together. As confident as we were, the competition was fierce. Everything rested with the judge’s decision. When the winner was first announced, it took me a moment to realise that we had won. 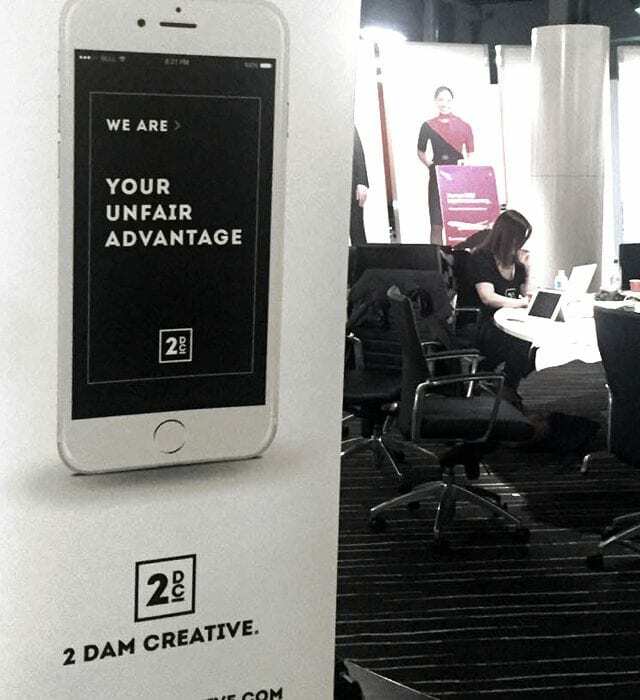 In the exhausted fog of my mind, I failed to register that 2 Dam Edgy was, in fact, us – an innovative partnership between 2 Dam Creative and Edgelabs – and we had just won the 2016 Qantas Codeshare Hackathon. Rewind to two weeks earlier when we were offered the chance to enter the Hackathon. I knew that 2 Dam Creative had the creative design flair and technical ability to match any of our competition and I’ve known Stuart Hudson, Founder and CTO of Edgelabs for three years and we’ve worked on multiple projects together and I had supreme faith in their strategic skills and thought processes. By focusing on our combined strengths, I knew we would be tough to beat, and so 2 Dam Edgy was born. Now fast forward to the day of the Hackathon. Crews of decidedly more bright and chirpy hackers filed excitedly into the Qantas Centre for Service Excellence, overlooking Sydney Park in Alexandria, with a mission to create an app that would address the most pressing customer service challenges associated with seamless travel. We got straight to work. Stuart tapped into a frequent flyer group on Linkedin and asked them what is their most stressful part of flying. And the answer was a resounding Transfers! So we then looked at how we could alleviate the stress and anxiety associated with navigating an unfamiliar airport environment so that Qantas customers could have an exceptional end-to-end experience of getting from A to B with minimal stress. The big question was…how? A bunch of suggestions were thrown around, but none of them really popped up and screamed “winner”. During a quick break for caffeinated beverages, one of our crew opened her phone to check for Pokemon. This was August 2016, and the world had gone briefly and spectacularly insane in the pursuit of imaginary digital monsters. That was it! Almost spontaneously, we burst into action. What if we could utilise Augmented Reality, powered by iBeacon technology to help our stressed-out traveller get to her connecting flight in a way that was simple, interactive and entertaining? We knew we were onto something and we set to work converting our vision into a reality. We bounced our ideas off some of the Qantas subject matter experts and tested our hypothesis with some real-life Qantas frequent fliers. Everyone agreed, finding a way to let passengers know where they need to go and how much time they have to get there would be the just the tool to make seamless travel a reality. So began the race against time to put something together in time to pitch. Ideas became storyboards. Storyboards evolved into wireframes. Wireframes morphed into designs. All the while, our developer coded like a caffeine-fueled machine to keep up with the creative vision. After what seemed like an eternity of mad work throwing together a solution that would have made MacGyvor weep with joy, I stood on the stage with Stuart presenting our concept – Transfer Buddy. Our app would hold the traveller’s hand the entire way through the transfer process, integrating with iBeacon technology to precisely locate Irene’s bags and guide her effortlessly to her gate. Qantas had provided information feeds that we worked into the IA so that Irene could keep track of her flight status, gate information, whether her bags made it onto the flight and a host of other features. No stress, no fuss, just smooth sailing all the way to her flight. Awards and accolades are wonderful for any organisation. More important is what we learn from the experience and how we employ those lessons to deliver even better solutions to clients’ problems. The Qantas Hackathon was a vigorous test of our hypothesis that the intersection of stunning design and cutting-edge technology is the best place to meet and discover the most innovative ideas that will look beautiful and function seamlessly to change what we currently think is possible. This is the philosophy that we bring to all of our work. Pokemon Go brought AR technology into the wider public consciousness. We believe that the potential for this technology has barely begun to be tapped. The possibilities for integration into App design and development are limited only by the power of human imagination. This is just one powerful example in which we utilise these complementary strengths to create something truly exceptional and innovative.